Looking for a POS system? Things you must consider Before Stepping Out! 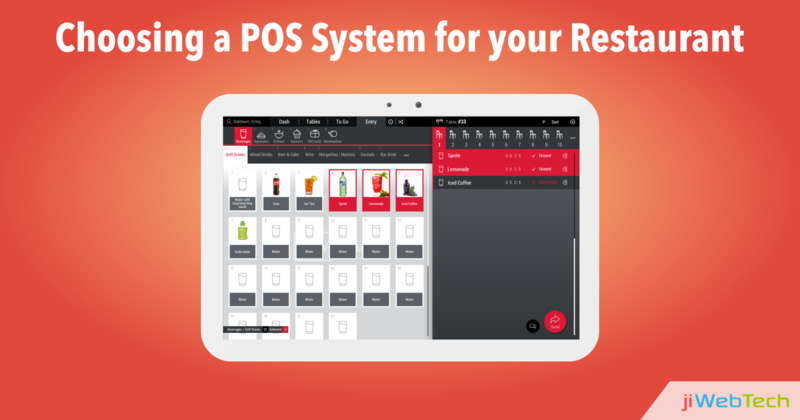 Choosing a POS system for your restaurant is not at all an easy task. And if yours is a startup business, then it becomes more difficult as you don't have an idea about the latest demands, trends, and shortcomings present in the food industry. Just because the technologies change every day, we simply can't take a risk while we choose a POS system for our restaurant. Isn't it? Simply looking for a vendor and discussing your requirements will not solve the problem right here. You need to know many things apart from this. You must know if the services offered by the vendor are well fitting to your framework or not, are they easy to integrate, and most importantly, are they even within your budget. Not only this, there are many more factors which are necessary to be focused on while you step out in the market to look up for a vendor. Here we are to assist you with the best solutions. We'll acknowledge you with the basic factors which you need to keep in mind while you are looking for a POS system for your restaurant. Let's get a quick overview and make the right choice! Pricing: It’s great that you have entered the market at this time because the prices of POS systems were very high till date. But thanks to the SaaS model which has made POS systems to fit within your defined budget. So, you can easily get a huge variety of options while you’ll enter the market. But remember one thing, as the number of vendors is increasing in the market, it might become difficult to choose the right one out of all. Take enough time, make a thorough research, and then finalize the vendor. Hurrying while making the choice will only let you in trouble. Scalability: You need to look up for a POS system which is easy to integrate with your existing system, can run on multiple terminals and supports mobile POS devices. Make sure about the speed and efficiency of that POS system, does it delivers quick results even in during the peak hours when the workload is more than the usual days. Report Analysis: Investing in a POS system directly means that you are demanding an easy and clear flow of information about the tasks which are carried out in your restaurant. Isn't it? So, make sure that the vendor you choose offers you the feature of maintaining automated reports of the sales you have made either on a month-wise basis or a weekly basis. Moreover, make sure that the reports can be sorted out category-wise or not, if yes, go for it. Otherwise, you need to look up for another vendor. Because maintaining manual reports is just not possible. Support: No matter that you have a good hold on your POS system, there are times that you need assistance in some of the tasks or during a sudden crash. If your POS vendor doesn't offer 24/7 support services, you are in trouble. So, it is necessary that you get 24/7 support from the vendor and get out of the problem you are stuck at. We have the best restaurant management solution for you! While you are investing a good amount in the POS system, you have got the full right to ask endless questions to your vendor. Once you get accurate answers to all your queries, you can make a step forward. If not, then don't panic. We have an alternative solution for you- jiMenu. It is one of the most trustworthy and reliable POS system solutions which offers the superior quality services at the most affordable prices. You can get in touch with us at any time to get more details. Vacation Mode is ON: Grab The Opportunity To Boost Your Restaurant‘s Sales This Summer! Managing the Customer Reviews to get the Best Out of Your Restaurant!